There are few things more difficult than supporting a loved one who suffers from Alzheimer’s disease. Whether they only have mild cases of memory loss or confusion, or they’ve slipped to the point that they no longer recognize the important people in their life, it’s a difficult thing to watch someone you care about struggling with a cruel disease that robs its victims of one of the basic things that makes us the people we are. While you face the reality that your loved one is dealing with an unfair and horrible challenge, it’s important to know that you don’t have to face this burden alone. In-home care in Los Angeles is available for those adults who struggle with Alzheimer’s, and it can help both them and you through the difficult time by providing your loved one with the care he or she needs whenever it’s necessary. If you’re not at the age where you’ve either needed to use Medicare or know anyone who has, you might simply think of Medicare as nothing more than health insurance for seniors; similar to your own health insurance, but tailored to their needs. However, Medicare is broken down into multiple parts, some of which are specifically designed to help senior citizens dealing with Alzheimer’s and who find themselves in need of in-home care in Los Angeles. The main things you’ll want to focus on are Medicare Part A and Medicare Part B. Part A is specifically designed for seniors unable to leave their homes and who require in-home care to meet all their needs. If your loved one’s issues with Alzheimer’s have reached the point where it’s not safe for him or her to be outside the home without supervision for any period of time, Part A would be the solution that provides coverage for in-home care. The thing to remember is that Part A will only provide coverage for as long as the person is homebound and cannot get themselves around without help. It’s normally used for injuries, and once the person has recovered enough to be able to get around without help, Part A no longer provides any services. With that being the case, if your loved one’s disease is not yet at the point where he or she is homebound, but you’d still like to get in-home care in Los Angeles to meet their needs, Part B would be the solution for you and your family. Unlike Part A, Part B doesn’t require the patient to be homebound at all times. It can be used for patients who have a condition that’s getting worse, but doesn’t require them to be at home at all times. In the case of patients who don’t have severe Alzheimer’s, Part B is likely the best choice because it can cover expenses, but still allows your loved one the ability to leave the home and enjoy his or her good days. Alzheimer’s is a complicated and cruel disease that is rarely consistent, as those who suffer from the disease are perfectly capable of being themselves one minute and falling into a state of confusion minutes later. When it’s someone who means a great deal to you, like a parent or a grandparent, you might find yourself struggling with the emotions of watching someone you love in a difficult state. That’s where the benefits of in-home care in Los Angeles can come in to help both of you deal with the challenges of your life. An experienced provider knows how to deal with those who suffer from Alzheimer’s and how to handle it when the patient is having a rough day and needs assistance. Plus, a provider who doesn’t have a previous relationship with the patient has one key benefit that a loved one does not: the provider is not likely to take anything said in a state of confusion personally. As much as you know that the person you love isn’t in control of their mental faculties, it can be hard to hear them blame you for their issues and call you a horrible person for not helping them. A caregiver can help with these tough times and will use past experience to help calm your loved one down to get them past the issue. This can help you avoid the tough and uncomfortable emotional situations. 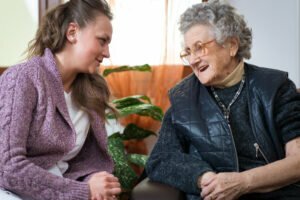 Whether having in-home care in Los Angeles is an absolute necessity or merely a precautionary step to help your loved one maintain a sense of independence, it’s important to know that your loved one is in good hands whenever you can’t be there for them or the situation becomes too difficult to handle. By finding an appropriate caregiver you can trust, you can help your loved one and allow them to live the best life they can in their remaining years. What is Sundowning Syndrome and How Does it Affect Seniors?